For the past eight years, Hatch Detroit has run a contest that awards up-and-coming entrepreneurs a $50K grant to build out their brick and mortar storefronts. The Contest is an opportunity for one savvy entrepreneur to win a $50,000 grant to open their brick and mortar retail business in Detroit, Highland Park, or Hamtramck. We believe that independent retail helps define the character and personality of city neighborhoods and we built this Contest on the idea of crowd entrepreneurship— giving community members a role in the city’s redevelopment. Vote for your favorite business for their chance at the $50K grant to open up shop. We will soon be sharing our spring announcement for our 2019 Comerica Hatch Detroit Contest! 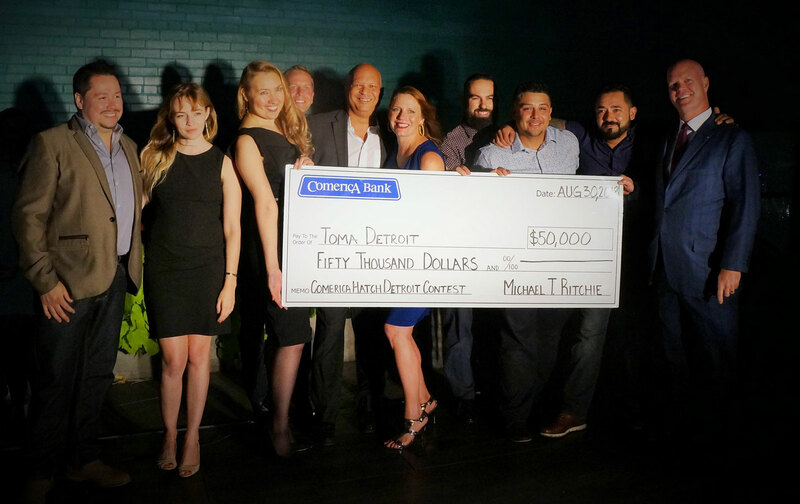 Congratulations to the 2018 Comerica Hatch Detroit Contest Winner — Toma Detroit! Please see here for the full list of Contest Rules. Any other questions? CONTACT US. What is the Hatch Detroit Contest? The Hatch Detroit Contest is a retail competition and chance for one savvy entrepreneur to win a $50K grant to open up their brick & mortar storefront in Detroit, Highland Park or Hamtramck. The storefront is key! We’re looking to invest in businesses that will revitalize commercial retail strips, activate vacant spaces & spur further investment into the community. What types of businesses are eligible to apply for the Contest? We’re focused on independent brick & mortar retail. This means no food trucks (though we love them!) and no franchise stores. We accept social entrepreneurs, non-profits and L3C’s, so long as there is a focused and strong retail component. In terms of retail, this can run the whole gamut of exchanging goods and services: a record shop, a bodega, a yoga studio, a bar, a gym, a restaurant… we’re excited to see what Detroit comes up with! Outside the chance at the grand prize, how do businesses benefit from the Contest? If your business places into the Top 10 Semi Finalist round, your business will receive extraordinary publicity. Your name is in front of thousands of potential customers… not to mention other potential funders. You’ll also be welcomed into our Hatch Detroit Alumni Program, which offers technical support and the opportunity for additional spot grant funding. How many times can a business submit to the Hatch Detroit Contest? If you haven’t placed into the Top 10 Semi Finalist Round, there is no limit on the number of times you can submit to the contest. If you have placed into the Top 10 Semi Finalist round, your application must be a completely different business plan. We hope that each round of the Contest is a learning experience for applicants… and we’ve have been glad to see entrepreneurs return with stronger applications each year! In short? We look for businesses that are viable and sustainable; businesses that will fill a retail gap currently existing in the city. We want to hear how your business will engage and positively impact the surrounding community. When you fill out your application, be clear and concise about your vision and let us know what sets you apart from all of the other applicants. You’ll receive an email notification that your application has been accepted. After narrowing the pool down to the top 25 applications, a group of local community and business leaders will read through submissions and determine the top-ranking candidates, who will be notified via the email address listed on their application. The Top 10 Semi-Finalist businesses will go to public vote in our primaries!